The cytoskeleton is a network of filaments and tubules that extends throughout a cell, through the cytoplasm, which is all of the material within a cell except for the nucleus. It is found in all cells, though the proteins that it is made of vary between organisms. The cytoskeleton supports the cell, gives it shape, organizes and tethers the organelles, and has roles in molecule transport, cell division and cell signaling. All cells have a cytoskeleton, but usually the cytoskeleton of eukaryotic cells is what is meant when discussing the cytoskeleton. Eukaryotic cells are complex cells that have a nucleus and organelles. Plants, animals, fungi, and protists have eukaryotic cells. Prokaryotic cells are less complex, with no true nucleus or organelles except ribosomes, and they are found in the single-celled organisms bacteria and archaea. The cytoskeleton of prokaryotic cells was originally thought not to exist; it was not discovered until the early 1990s. The eukaryotic cytoskeleton consists of three types of filaments, which are elongated chains of proteins: microfilaments, intermediate filaments, and microtubules. The microfilaments of this cell are shown in red, while microtubules are shown in green. The blue dots are nuclei. Microfilaments are also called actin filaments because they are mostly composed of the protein actin; their structure is two strands of actin wound in a spiral. They are about 7 nanometers thick, making them the thinnest filaments in the cytoskeleton. Microfilaments have many functions. They aid in cytokinesis, which is the division of a cytoplasm of a cell when it is dividing into two daughter cells. They aid in cell motility and allow single-celled organisms like amoebas to move. They are also involved in cytoplasmic streaming, which is the flowing of cytosol (the liquid part of the cytoplasm) throughout the cell. Cytoplasmic streaming transports nutrients and cell organelles. Microfilaments are also part of muscle cells and allow these cells to contract, along with myosin. Actin and myosin are the two main components of muscle contractile elements. Intermediate filaments are about 8-12 nm wide; they are called intermediate because they are in-between the size of microfilaments and microtubules. Intermediate filaments are made of different proteins such as keratin (found in hair and nails, and also in animals with scales, horns, or hooves), vimentin, desmin, and lamin. All intermediate filaments are found in the cytoplasm except for lamins, which are found in the nucleus and help support the nuclear envelope that surrounds the nucleus. The intermediate filaments in the cytoplasm maintain the cell’s shape, bear tension, and provide structural support to the cell. 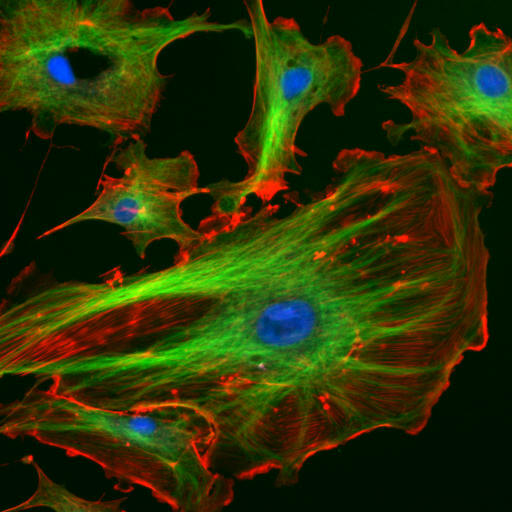 Microtubules are the largest of the cytoskeleton’s fibers at about 23 nm. They are hollow tubes made of alpha and beta tubulin. Microtubules form structures like flagella, which are “tails” that propel a cell forward. They are also found in structures like cilia, which are appendages that increase a cell’s surface area and in some cases allow the cell to move. Most of the microtubules in an animal cell come from a cell organelle called the centrosome, which is a microtubule organizing center (MTOC). The centrosome is found near the middle of the cell, and microtubules radiate outward from it. Microtubules are important in forming the spindle apparatus (or mitotic spindle), which separates sister chromatids so that one copy can go to each daughter cell during cell division. They are also involved in transporting molecules within the cell and in the formation of the cell wall in plant cells. As described above, the cytoskeleton has several functions. First, it gives the cell shape. This is especially important in cells without cell walls, such as animal cells, that do not get their shape from a thick outer layer. It can also give the cell movement. The microfilaments and microtubules can disassemble, reassemble, and contract, allowing cells to crawl and migrate, and microtubules help form structures like cilia and flagella that allow for cell movement. The cytoskeleton organizes the cell and keeps the cell’s organelles in place, but it also aids in the movement of organelles throughout the cell. For example, during endocytosis when a cell engulfs a molecule, microfilaments pull the vesicle containing the engulfed particles into the cell. Similarly, the cytoskeleton helps move chromosomes during cell division. One analogy for the cytoskeleton is the frame of a building. Like a building’s frame, the cytoskeleton is the “frame” of the cell, keeping structures in place, providing support, and giving the cell a definite shape. Organelle – A specialized structure within a cell that carries out a certain function. Cytoplasm – All the contents of a cell except for the nucleus. Spindle apparatus – A structure formed mainly by microtubules that separates chromosomes during cell division. Proteins – Molecules made up of amino acids that have many different roles in the body, including forming the cytoskeleton. 1. What cell organelle is a microtubule organizing center? B is correct. The centrosome is an organelle located in the middle of the cell that organizes microtubules, which radiate outward from it. It is only found in animal cells, not in other eukaryotic cells like those of plants or fungi. 2. Which type of cytoskeletal filament is the thickest in diameter? A is correct. Microtubules are the thickest component of the cytoskeleton, while microfilaments are the thinnest. Intermediate filaments are, as their name suggests, in between microtubules and microfilaments in thickness. 3. Which is a function of the cytoskeleton? D is correct. The cytoskeleton has a variety of functions, including all of these choices. In addition, it plays roles in cell signaling, transport of materials, and organizing cell organelles.